In general tracking share price charts seems a very unhealthy way to approach investing. By that I mean that you can pick the best companies in the world – the ones that have produced double digit annual returns over sixty plus years – and always find periods in which the stock tanked or performed poorly vis-a-vis peers or some benchmark index. For instance check out Disney stock in the mid-1990s. It was flat as a pancake. McDonald’s stock suffered a similar fate between the mid-1990s and early-2000s. Both are amongst the market’s best performers over the past few decades. 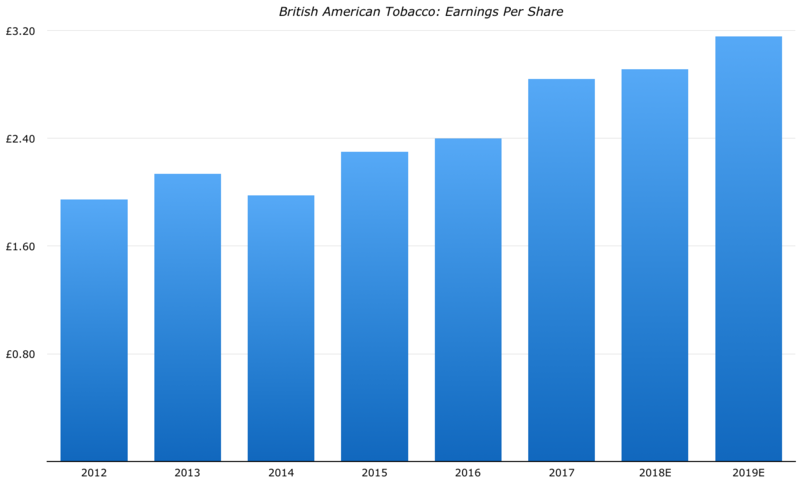 That said, the fall of tobacco giant British American Tobacco, another defensive stalwart, looks pretty shocking. Back in the summer of 2017 the shares were riding high at around £56 each on the London Stock Exchange. Fast forward to the present day and they are trading for around £26.85. From peak to present we are looking at a decline of over 50%; an absolutely catastrophic performance as far as shareholders are concerned. Indeed as far as I can tell the last time the share were this low was way back in 2011. That’s almost the entire bull market performance wiped out in the space of 17 months. Here is the really galling thing for shareholders (well aside from seeing 50% of your capital wiped out that is). Based purely on the underlying profit figures the stock price performance is entirely inexplicable. In 2012, for instance, the company made just under £1.95 per share in net profit for its stockholders. By 2016 that figure had risen to around £2.40 per share. This year it should, assuming analyst forecasts are accurate, surpass the £2.90 per share mark. Next year analysts have penciled in a figure of over £3.15 per share for net income. If we average that sequence out, then we arrive at average profit per share growth of something like 7% for the period starting 2012 and ending 2019 (hypothetically). Very respectable profit growth yet a round trip for the share price doesn’t seem right. The kicker? British American Tobacco’s net debt has exploded over the same time frame. In fact the debt load is now so big that despite losing 50% of its value and trading at around 9.5x earnings the stock’s debt adjusted valuation metrics still don’t like super cheap. Last time I checked the stock was trading at 12x EV/EBITDA (enterprise value – net debt plus market capitalization – dividend by earnings before interest, taxes, depreciation and amortization). That is not a particularly standout figure in either direction. In terms of debt service the raw figures look something like this. The company generates around £6.5 billion in cash flow each year. Stripping out capital expenditure and the dividend leaves around £1 billion per annum for debt reduction; a figure that should rise going forward. The dividend yield tops 7%. Even a hypothetical cut could leave a rock solid 5% yield, at the current share price, with plenty of cash left for debt reduction. Granted some folks will never touch tobacco stocks, whether that be for ethical reasons or the generally grim outlook for high margin branded cigarette sales (indeed the proposed FDA ban on menthol cigarettes sent the stock down recently). That said, this is surely the most attractive entry point that the stock has offered up in years.